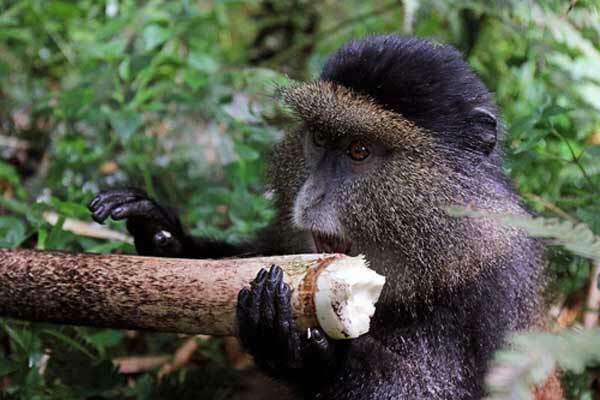 10 days Rwanda Gorilla trekking, Golden monkey trekking, Chimpanzee tracking, Nyungwe Canopy walk, Lake Kivu for boat cruise, Akagera national park for wildlife and a boat cruise and Bird watching Tour. 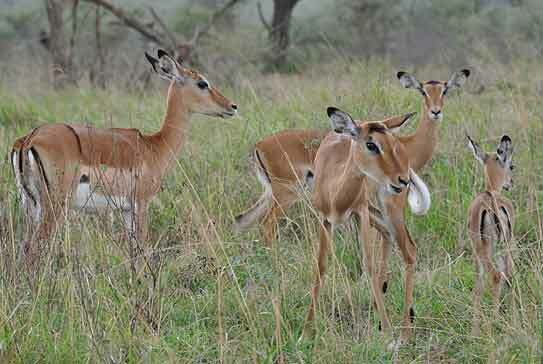 This 10 days wonderful safari of Rwanda will take you to see the best tourist attractions in Rwanda. Rwanda is a small country in the east of Africa. However, this country is blessed with wildlife. Rwanda is famous for Gorilla trekking safaris, however, Rwanda has a lot of other attractions to offer. Besides Gorilla trekking in Volcanoes National park, other activities can be done as well. In Volcanoes national park you can also do Golden monkey trekking. Golden monkeys are rare species of primates and can only be located here in Volcanoes National park, Mgahinga National park in Uganda and in DR Congo. They are comfortable living in the bamboo section of the forest jumping from tree to tree. These small primates are very beautiful clad in Gold and Silver, hence the name, Golden Monkey. 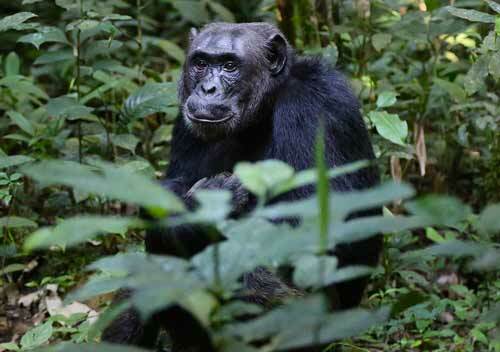 The tour also takes you to Nyungwe forest for Chimpanzee tracking. In Rwanda, Nyungwe forest is where you can track Chimpanzee in their natural habitat. The chimps are social animals, close to the humans and a sight of them and their way of life will leave you in awe. 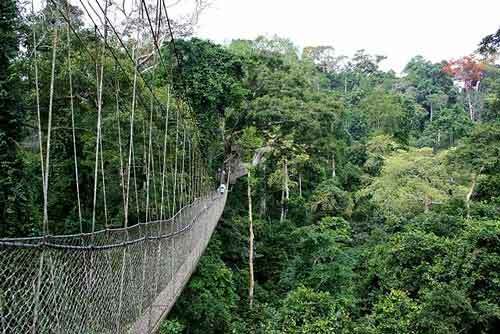 Nyungwe forest National park is on of the few places where you can do a CANOPY WALK in Africa. This lifetime opportunity presents a bird eyes view of the forest. You can't imagine the thrill and excitement when you walk on top of trees 50m above the ground. The rest of the safari will take you to Lake Kivu for relaxation and serenity, wildlife gaming in Akagera National park for Lions, Leopards, giraffes, buffalos, elephants, zebras and many antelopes, boat cruise for bird watching and game viewing. The cost of gorilla trekking permit in Rwanda is $1500. The cost of the permit is $100 which includes the park entry fees and security. Upon your arrival at Kigali international airport you will be received by our company representative and your safari guide to be. The guide is Avery knowledgeable person please ask him anything you want to know about country, and he will recommend the best of what you want, like changing money, good place for Lunch etc. You then enjoy a City tour and you can also visit the Kigali Genocide museum before setting off for Volcanoes National Park. Today you start the day early in the morning with breakfast and packed snacks, drive to the park headquarters for briefing and knowing the group/ gorilla family you will be visiting. This done by the park authorities and arranging the days visitors into groups before being led by the ranger guide in the forest for a life time trekking for the worlds endangered Mountain Gorillas. The duration of trekking is not fixed due to several determinant factors, but surely you will find them and it will bring your heart at rest, however hard it might have been getting to them. You then spend a quality hour with them before coming back to the lodge. After breakfast you return back to the park headquarters but this time for Golden monkey trekking, these are also endangered primates only found in the Virunga conservation area. Golden monkeys are very unique from the physical appearance and social life. After tracking return to the lodge for hot lunch and visit the cultural village in the afternoon/evening. A few kilometers from Volcanoes National park lies a very beautiful lake called Kivu and this is your destination after breakfast. Check in your place of accommodation and go for a boat ride on the lake visiting some island on the lake and the hot springs. Return to the lodge for lunch and a relaxing evening. A lakeside drive as you transfers from Lake Kivu to Nyungwe forest national park. After breakfast you will enjoy a scenic ride of the rolling hills of tea plantations and rice fields with numerous stops for photos. Lunch on the way before checking into your lodge in the late afternoon. After a very early morning breakfast, you will assemble at the park offices to meet your ranger guide who will lead you in the forest for Chimpanzee trekking after being driven to the starting point. 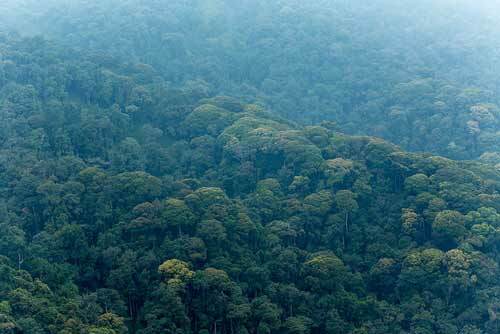 Our close cousins leave only in this forest and its one of the few remaining old rain forests in the whole world. Tracking chimpanzee is amazing but walking in this rain forest is also rewarding as it’s natural. After chimpanzee you will return to lodge. A long drive but very scenic. A very early morning departure to Akagera National park driving through Nyungwe forest and connecting via Kigali. Driving through villages and small towns much of them tea growing communities and potatoes plus climbing bean poles. Arriving to the park in early evening with an option of doing any evening game drive. Check in at the lodge. Dinner. After breakfast you will drive around the park searching for Lions, leopards, giraffes, buffalos, elephants, zebras and many antelopes. The birding opportunity is also rich with a lot to the check list. In the afternoon set off for a boat cruise on the lake to see the hippopotamus and crocodiles plus a number of water birds like the fish eagles, kingfishers, Egyptian goose among others. The wonderful adventure is coming to an end. You will have breakfast and short game drive before returning back to Kigali for your flight back home with a lot to tell. Sad to say but our services come to an end. 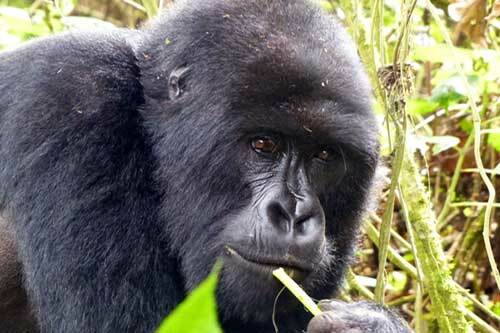 A Gorilla trekking and golden monkey trekking Rwanda safari in Volcanoes national park in 3 days.